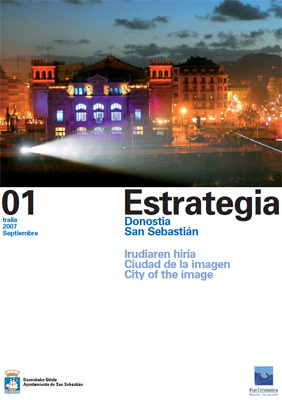 The first issue of the Strategy magazine is a monographic publication dedicated to the sector of image, creativity and culture in the city. The magazine was published on paper, in three languages (Basque, Spanish and English) with a circulation of 3,000 copies. A large part of these were handed out to accredited guests at the San Sebastian International Film Festival. The magazine contains an interview with the then director of Tabakalera, Joxean Muñoz, reports on the economic impact of festivals in the city (Heineken Jazzaldia, Film Festival, Human Rights Film Festival, Horror & Fantasy Film Festival, Classical Music Fortnight, etc. ), the 20th anniversary of the EITB Basque Radio and Television Corporation in Gipuzkoa, the Audiovisual Innovation Pole, PI@ and others.